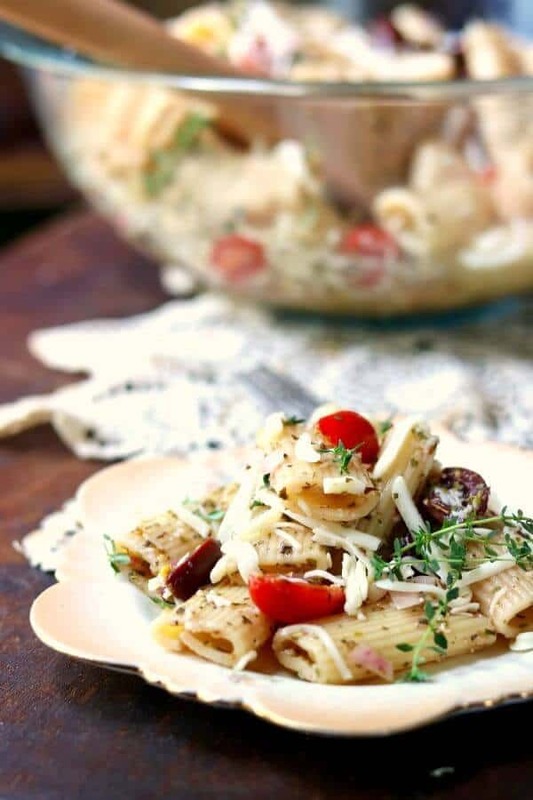 This easy Italian pasta salad recipe has a tangy -sweet cider vinegar dressing. Black olives, rigatoni, purple onions, and Italian seasonings are the foundation – you just need to add your favorite ingredients. Pepperoni, tomatoes, and shredded cheese are all good choices! 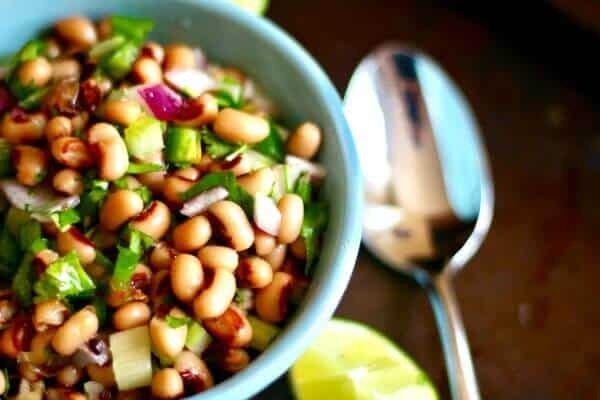 Make it a side dish or add protein to transform it into a simple summer meal. This post has been updated from the original May 2008 publish date. When I owned the tea room this pasta salad was the number one side dish on the menu. It was bigger than our hand cut French fries, bigger than the crispy onion rings, and even bigger than the cut fruit with lavender creme fraiche. Of course the reason for that is the same now as it was then — this stuff is addictive! It doesn’t take long to make but you have to allow time for it to sit overnight. During that time the pasta soaks up the simple vinaigrette so that every bite is bursting with flavor. Don’t skimp on this step or try to cut it short — you can’t get the same flavor. Keep in mind that you might need to add a little more of the vinegar and sugar mixture before serving if it’s soaked it all up. I measure the Italian seasoning by the handful for this. It sounds like a lot but you’ll have to trust me on this. Just do it. My hands hold about 3 tablespoons of seasoning so that’s the measurement I’m using. You can use more or less depending on your own tastes. So, yeah. I get it. Who ever heard of rigatoni in pasta salad? The thing is those big tubes of chewy pasta soak up the dressing. Tiny pieces of purple onion, herbs, and olives play hide and seek in the interiors of the tubes so that you get a surprise flavor blast in every bite. Will it be onion? Olive? You won’t know until you take a bite. You can substitute rotini pasta or something else but just try it my way at least once, please? 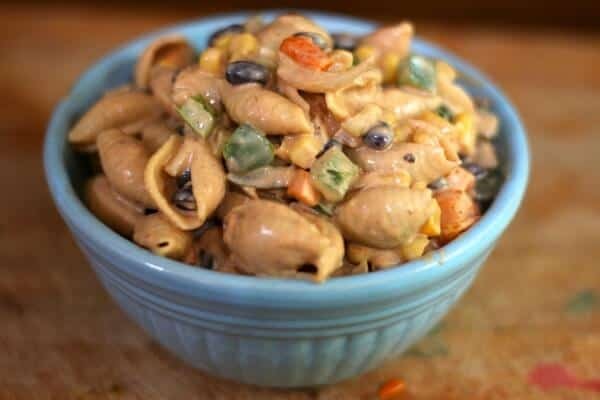 This pasta salad is the perfect potluck recipe. It dresses up al fresco dinners on the deck. It graciously accepts your leftover ham, chicken, or other leftovers. I know I can’t get through summer without it. The following are affiliate links. We are a participant in the Amazon Services LLC Associates Program, an affiliate advertising program designed to provide a means for us to earn fees by linking to Amazon.com and affiliated sites.! I love this serving bowl! It’s such a refreshing color for summer. Tender rigatoni pasta, onion, and black olives marinate in a tangy-sweet vinegar and sugar mixture overnight to create a deliciously simple side dish. Or, add protein for a main dish salad. Cook the rigatoni until over done. Yep. Overdone. Nope. I am not kidding. Do not try this with a la dente pasta it won't work. It needs to be very cooked, but still hold it's shape. Pour the vinegar and sugar mixture over the pasta. Dump the handful of herbs on it. Mix thoroughly and let cool. 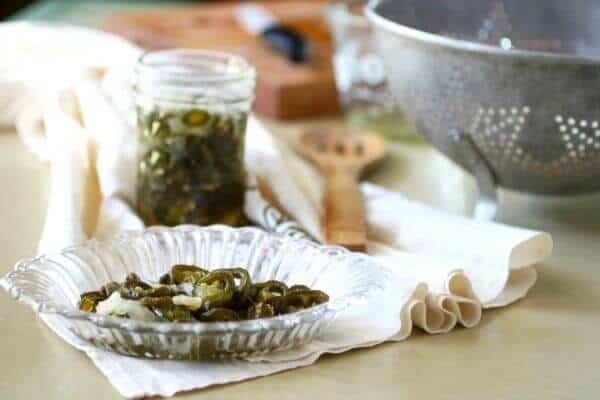 Add the onion and black olives and mix well. Stir gently before serving - you may need to add a little more of the vinegar sugar mixture. 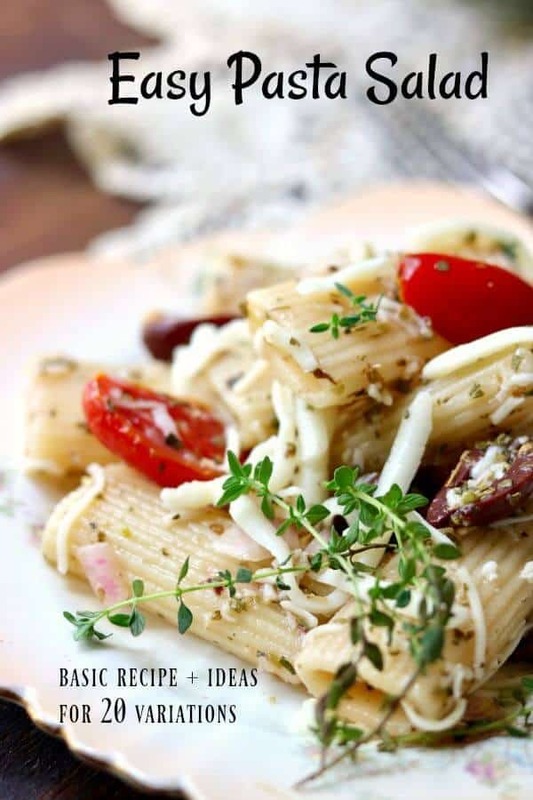 may add: shredded Mozzarella or Parmesan, halved cherry tomatoes, chopped parsley, cooked chicken, etc.